VJ Books Presents Author Karen Dionne! Karen Dionne is the author of The Marsh King's Daughter, a dark psychological suspense novel set in Michigan's Upper Peninsula wilderness. Dionne is cofounder of the online writers community Backspace, and organizes the Salt Cay Writers Retreat held every other year on a private island in the Bahamas. She is a member of the International Thriller Writers, where she served on the board of directors as Vice President, Technology. Her short fiction has appeared in Bathtub Gin, The Adirondack Review, Futures Mysterious Anthology Magazine, and Thought Magazine, as well as First Thrills: High-Octane Stories from the Hottest Thriller Authors, an anthology of short stories from bestselling and emerging authors edited by Lee Child. Dionne has written about the publishing industry from an author's perspective for AOL's DailyFinance, and blogs at The Huffington Post. Other articles and essays have been published in Writer's Digest Magazine, RT Book Reviews, Guide to Literary Agents, and Handbook of Novel Writing (Writers Digest Books). Dionne has been honored by the Michigan Humanities Council as a Humanities Scholar for her body of work as an author, writer, and as co-founder of Backspace. She enjoys nature photography and lives with her husband in Detroit's northern suburbs. 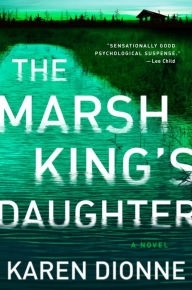 New York Times bestselling author Lee Child had this to say about Dionne's The Marsh King's Daughter, "Sensationally good psychological suspense--I loved this book." Modern Signed Books interviews Jeffery Deaver on BlogTalk Radio. Book - Advance Reading Copy 2017 NY: Penguin Advance reading copy, mint, new/unread in pictorial wraps. Author Signed Hardcover Book. June 2017 NY: Putnam First edition, first printing, mint, new/unread in a flawless dust jacket, signed by the author. Each dust jacket is protected in an acid-free archival quality acetate cover.